Born in St Petersburg, Russia, George Lambert arrived in Australia in 1887. After studying at Julian Ashton's art school in Sydney 1896-1900, he won the first New South Wales Travelling Art Scholarship and lived and worked in England and Europe for the next two decades, before returning to Australia in 1921. Best remembered for his portraits and figure compositions and for his work as an official war artist during World War I, Lambert initially established himself as a illustrator for periodicals such as 'The bulletin' and 'Australian magazine'. The Gallery has over 100 paintings and drawings by Lambert, including his popular early masterpiece 'Across the black soil plains' 1899. 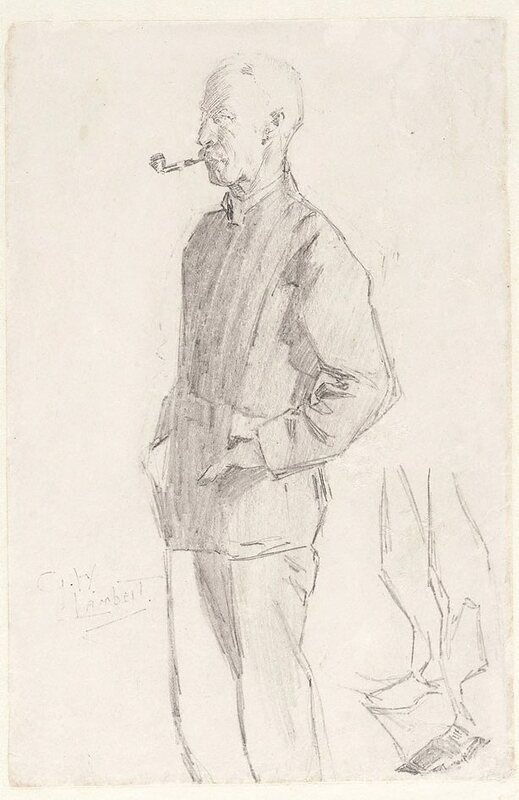 Lambert was 23 when he made this drawing, in Julian Ashton's studio at Vickery's Chambers, Pitt Street, Sydney, where the Art Society also held its classes. Signed l.l. "G.W./ LAMberT". Not dated. The Art of George W Lambert , Sydney, 1924, 20. Now came still evening on , Sydney, 1941, opposite 30 (illus.). Hendrik Kolenberg, 19th century Australian watercolours, drawing and pastels from the Gallery's collection , 'Introduction', pg. 6-16, Sydney, 2005, 10, 126, 127 (colour illus.). Purchases and acquisitions for 1959 , Sydney, 1959, 12. Art and Artifice: George Lambert (1873-1930) , 1996, 13 (illus. ).